So many exciting things are happening at Emena Spa, located in the trendy Miami design district. Emena is elated to welcome their newest member Xavier Soto, a well known celebrity stylist from NYC. He has chosen to call Emena Spa his new Miami home. He is well known for his amazing haircuts- a true “artist” he is thought of by all his celebrity clients. Xavier’s resume is seasoned for sure! He helped launch the John Frieda Hair Salon and product upon their British invasion of New York. Some of his stints have been with Vogue, the Queer Eye Guys, Lenny Kravitz, photographers such as Annie Liebowitz, Patrick Demacheller and David LaChappelle to name a few! Just a few more reasons why we know he is an amazing addition to the already fabulous Emena team. Xavier will be available for consultations by appointment only. 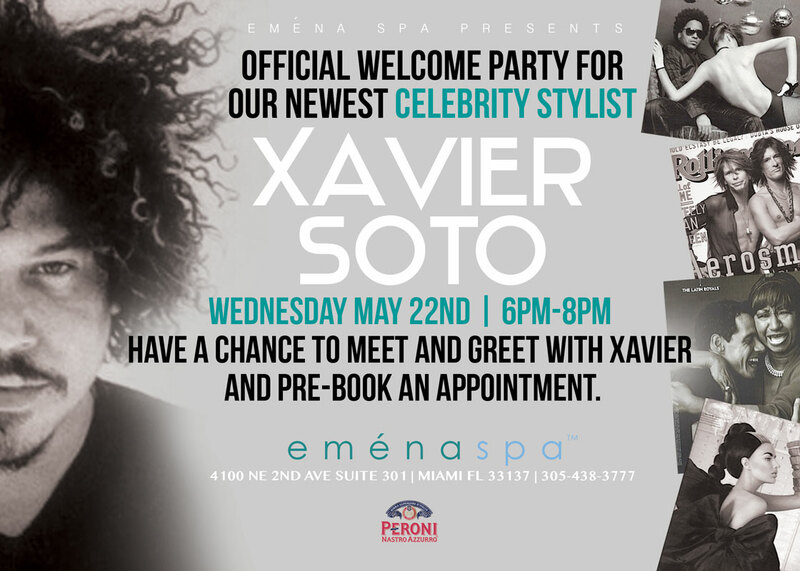 His official “welcome” to Miami, will be thrown Emena style with a fabulous event at the spa Wednesday May 22nd from 6-8pm. Come sip on a peroni beer, meet and greet with him, and book an appointment before the word gets out. There will be Emena specials available just for the event.